In a society where women are already vulnerable, the SAPS are entrusted with the protection of the people. The first instinct of protectors, when faced with vulnerable elements of society, should be to enquire what assistance could be offered. At a time where the vulnerability of women is highlighted daily, the SAPS must adhere to the Constitution and be held to a standard higher than anyone else By REBECCA SIBANDA. The South Gauteng High Court recently made a ruling concerning the conditions of detention in police holding cells, among other issues. The Mathe v the Minister of Police case was an application for damages, as a result of the trauma experienced by the plaintiff at the hands of the South African Police Service (SAPS). Whilst it was action for damages, key constitutional questions were raised. The facts of the case briefly: the plaintiff and her friends were arrested for the offence of prostitution after being found seated outside a service station, awaiting public transport in the early hours of the morning. An unmarked police vehicle arrived and plain-clothes police officers arrested them without first informing them of their rights in terms of section 35(1) of the Constitution. This provision addresses the rights of those arrested for allegedly committing a criminal offence and includes the right to be informed of their rights. The officers also failed to identify themselves as police officers before bundling the women into the vehicle. There was a short exchange before they left for the police station and, in essence, the women were arrested simply for being women who were seated outside a filling station in the middle of the night. Upon arrival at the police station, the women were placed in a holding cell and not given an opportunity to contact anyone as per their section 35(2)(f) rights. Only after these events were they informed that they were being charged with the offence of prostitution. The Constitution in section 35(2)(a), requires that any detained person be promptly informed of the reason for their detention. In this case, the women had to wait a while before this happened. They were only so informed at 07h00 after being held for hours. The cell in which they were held housed five people and was filthy. The cell had one toilet, which was not functional, and they were forced to relieve themselves there, despite its condition, and in full view of the cell’s other occupants. The cell was furnished with blankets, which like the cell, were dirty and could not be used, and smelled as a result of the blocked toilet. The ordeal lasted almost 37 hours. The Constitution in section 35(2)(e) affords detained persons the right to conditions of detention which are consistent with human dignity. The right to freedom and security of the person is essential to human dignity and its arbitrary deprivation is proscribed by the Constitution. The fact that the arresting officers made an assumption about the women and arrested them for a crime they had not committed amounts to the deprivation of freedom without just cause. As the court noted, had the women been men seated outside a service station at that time awaiting public transport, it is highly unlikely there would have been any incident. Women are entitled to equal treatment and this discrimination based on their gender, is an infringement of this right. Furthermore, in a society where women are already vulnerable, the SAPS are entrusted with the protection of the people (as per section 205 of the Constitution). The first instinct of protectors, when faced with vulnerable elements of society, should be to enquire what assistance could be offered. The officers could have waited with the women until such time as their transport arrived. Instead, they bundled them into a car without following procedure and infringed on their constitutional rights. To add insult to injury, the conditions of the cell in which they had to stay for a day and a half did not meet the necessary basic standards. Even where an arrest is lawful, the conditions of detention must be of a standard compatible with human dignity. Decent sanitation, warmth and nutrition should be considered the bare minimum. It is also true that the degrading treatment of detainees and poor conditions in pre-trial facilities (including police station holding cells) are commonplace in Africa. They rarely meet international and regional standards. The SAPS owe a duty to protect and defend, but also to stand by the human rights espoused in the Constitution in every way possible. 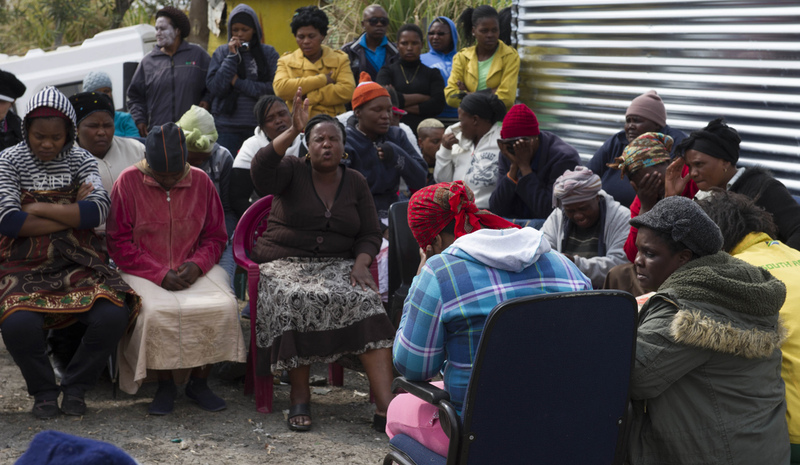 Photo: Women protest the wounding of their neighbours by the police, Nkaneng, Marikana, North West, South Africa, 15 September 2012. Police had running battles with residents of Nkaneng shantytown. Photo Branko Brkic / Daily Maverick.